I am trying my best to get my life organized. There is a lot going on now and it seems there isn’t enough time-slots to fit it all into. It is exciting. One of the most exciting events waiting, is my trip to South Africa in February. And then a big excitement…my watercolour palette is in the mail(just in time for my trip), which I’ve been waiting for since last year October!! I will show and tell all about it when it arrives. Along with that, I am busy making my own watercolour sketchbooks, with Marta‘s help by email! Since the first brushstroke I gave in her handmade sketchbook last year, I knew I wouldn’t experience that contentment in a bought sketchbook again. In the meantime I have studied and read a lot, ordered all my bookmaking stuff and I’m ready. First I dreaded it and now that I know a little more, I’m looking forward to it. I will post that as well as soon as my first book is done. And I then also have an appointment to discuss exhibition(a tiny little one♥♥…), which has my knees all jello, partly because of excitement, but mostly it is because of fear and self doubt! In the meantime, I had a cancelled trip today and I sat in the sitting roomwith a coffee earlier, looking at our cliff at the back and thought the cave could be an interesting sketch. This is typical of our region, la Touraine… a lot of caves which the winemakers use for winemaking and cellars and people literally still live in the caves. Parts of their houses go into the mountaincliffs. Troglodytes (cave-dwellers, says the dictionary) They are well-lit, dehumidified, heated and very interesting! All along the Loire, you will see these Caves, (winecellars) and the houses attached to the cliffs. It makes for very interesting and different scenery and a sketcher’s dream I should think, which makes me wonder why I haven’t sketched it yet? Rochecorbon, Vouvray, Vernou, Montlouis sur Loire(my town) – it is on my list for when the weather allows….and my sketchbook is done! There is nothing going on in this cave of ours. It is deep and dark and narrow, swerving all the way into the moutain and joins up with our neighbour’s, winding further and then stops somewhere. Rotring pen(.25) and watercolour in moleskine. WOW!!! A trip to South Africa!!! Can you contain such joy??!!!! WOW! And pallette and sketchbook!! WAY TO GO RONELL!!!! I cannot WAIT to see whatyou’ll do with these!! AND an exhibition — of any size — if FANTASTIC!! BRAVA! BRAVA!! BRAVA! I’m on my way out the door to my ‘cave’ (the local gym)…joke aside it’s quiet bright and cherry and I’m looking forward to the workout before beginning my day of housework and Annie’s first art lesson. Yes, show us more of the caves!!! How intriguing it must be! So, I haven’t heard from you but think my suggestions for bookmaking got you going and ordering supplies. Great! Let me know when you are ready to start with cutting your paper, etc…and we will get right on it! this should be fun! A trip! Wow! I was just thinking it’s time for Rudy and I to sit with our calenders and think of where we’d like to go off to this year. I am so excited for you, an exhibit!!! No one is more worthy!!! tell us more!!! A trip to S Africa, how enthralling!!! Sketch it ALL!! New palette – share please. AND such interesting caves in your backyard – You certainly better sketch the cliff dwellers for us – What an exciting time for you and in January too – Lucky you!! Your cave is beautiful, Ronell. I love these colours together. Fascinating that you have such a feature on your own land. There’s so much in this post, I don’t know where to start. Exhibition – even small is a fabulous idea! Brava! Looking forward to a blow by blow on this one. Trip home also something great to look forward to. We will look forward to your travel sketchbook. Making your own sketchbooks is wonderful – I don’t know why I don’t try because I too love painting in Marta’s book. And your watercolour palette – I’m extremely intrigued about exactly what you’ve bought. Does mail take forever into France. I could die of old age waiting for something to arrive by mail here. Congratulations on having an exhibit, I’m sure you’ll be a fabulous success! And a trip to South Africa – how wonderful. I know we can look forward to many terrific sketches and stories about your trip. Wow, Ronell! So many exciting things to begin the New Year! How can you sound so calm and collected?!! I mean a trip to South Africa…!!! I’d be doing cartwheels (not that I know how… but still)!! And an exhibit, too???! Wow!!! How did you get so lucky all at once!!!! Kidding! I sound like I’m very jealous, I’m not. (Well, a teeny bit..) But truly I’m delighted for you!!! Tell us more when the time comes. I predict lots and lots of rave reviews for your exhibition. I wish I could be there to see your wonderful work in person. Love the cave. Have a safe and wonderful trip in February. Can’t wait to see what you will ave to share with us. Your very own cave…wow! You have made it look so full of interest that I myself see plenty ‘going on’ with it. How exciting to have caves! I love those inky lines in your painting. I can’t believe you haven’t already had an exhibit of your lovely artwork. I’m sure it will be a great success! I love the greens, blues and purples in this painting, Ronell. I love your cave sketch! Seems very mysterious to me…. and you say it links up with your neighbors?…. amazing! Do people ever get lost in there? I’m looking forward to hearing about your EXHIBIT!!!!!!! VERY cool!!! and your new palette! This blog entry has so much INFORMATION!! My goodness, a trip in Feb to S. Africa – you must be on top of the clouds!! A whole village of caves/wine cellars — oh my YES you do have sketching and painting possibilities right at your back door!! A little exhibition — doesn’t matter how little . . . it’s an EXHIBITION, so very excititing!! And, you’re sketching with oils–they are fantastic and I can’t wait to see more! Congratulations on the exhibition – I understand exactly how you feel – my only one was a college one, and I hated hanging my work. A tutor (who has had many exhibitions) said he always feels like this every time, so you are not alone. I like this sketch very much – very atmospheric, nice sense of mystery. 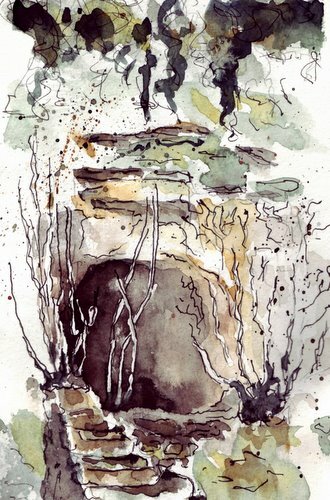 The caves sound so interesting….lovely sketch of the one near you. I really like the colours. You must be sooooooo excited about your trip to South Africa. How long will you be there for? Congrats Ronell! How exciting for you – it all sounds like the perfect adventure to start the new year. Love this sketch. It has such a lovely abstract quality, and the subdued colors are perfect. Hi Ronell, it’s great to see that you are still painting and sketching on a regular basis :). Oh, the cave sketch is dark and mysterious. Thank you for expaining about how people are living in them and the wine celler part. Very interesting. Great job on your sketch. Your trip sounds WONDERFUL. I’ve heard from others who have gone that it was a trip in a life time. Beautiful! So mysterious with the lovely grays and darks and yet bright at the same time. Your life seems so exotic to me, with neighborhood cave dwellers, and journeys to Africa. How exciting! Thank you for stopping by and leaving such encouraging comments…I appreciate it! Your style is evolvoing in such a loose and lovely way. I LOVE all the mark making. I’m taking a book binding class next month….must be in the air! Goodness, Ronell, an exhibit and a trip to South Africa! As to your rendering of the cave — bravo, because i wouldn’t know where to start in front of something like that. Very well done. Congratulations! How wonderful for you. A trip to S. Africa sounds wonderful and you do deserve a show. Your sketches are very beautiful. You must sketch on your trip and post the sketches. I look forward to seeing them.